Combine beautiful wood with reliable durability by choosing Lancaster Table & Seating's 36" x 36" solid wood live edge bar height table and barstools with antique walnut finish. It is perfect for rustic settings such as ski lodge cafes, Irish pubs, or country style restaurants. Thanks to its solid beech wood construction, this table is sturdy enough to handle the wear and tear of everyday use in your restaurant. Its underside includes v-shaped metal braces that prevent the wood from warping, ensuring that you can use this table top longer. At 36" in length, it can comfortably seat 4 guests. This table also features two live edges that create a rustic look and capture the natural beauty of the tree it was harvested from. The deep and rich antique walnut stain highlights the distinct beech wood grain and gives the table a warm, inviting hue. Each of the 4 barstools, as well as the bar height table base post, have the same antique walnut finish as the table top. The bar stools include foot rests to reduce the pressure on guests legs as they sit and a curved, rectangular backrest for optimal comfort. They are framed with dark grey metal for a contemporary and attractive contrast to the wood. Each leg of the stool is capped with plastic glides to prevent any damage to flooring, as well as to prevent noise when sliding across the floor. 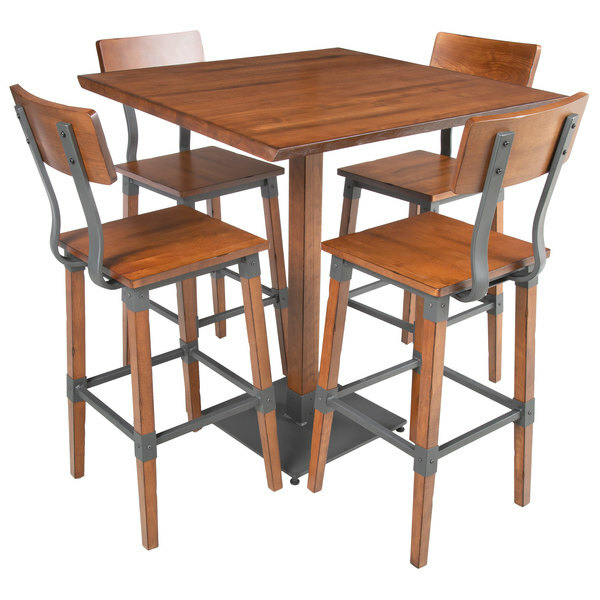 Purchase this table and barstools to provide a comfortable and distinct dining experience for your patrons.